Set your '16-Current Mazda MX-5 Miata apart from the rest with this unique Rally Stripe front bumper hood, roof and rear lid graphic kit. Easy-to-apply kit is packaged as a set of PRECUT pieces ready to install in a wide variety of colors - NO TRIMMING required! Stripe package is not just a set of 8" (20.32cm) straight strips in a box. Our graphic kit consists of prefitted and contoured pieces as shown in the illustration. 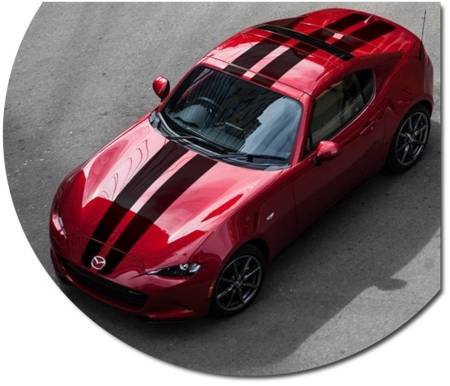 Kit is specifically made for the '16-Current Mazda MX-5 Miata factory front bumper, hood, roof and rear lid areas and will not fit any other vehicle.